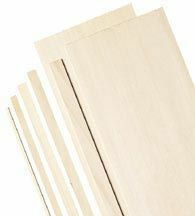 Selected Triple A Grade balsa wood blocks, sheets, and strips, cut to very close tolerances. Sizes listed are for ¾" scale models. 36" standard lengths unless otherwise specified. Use for any type of model building, especially aircraft, architectural, or engineering models. Balsa wood is light and soft but very strong. Can be easily cut and shaped with hand tools, sanding blocks and X-Acto®- style blades. Lightly sanding the wood produces a smooth, velvety feel. Finishes easily with standard water-based paints or varnishes. Excellent for home, classroom or office use. Individually bar-coded. 32 points will be rewarded when you are logged in to your account and buy this item.